It depends what you mean. Open Badges are issued with a learner’s individual identifier ‘baked’ into it. So if you try and take my badge and put it in your backpack, it’s not going to work. It’ll be rejected. If, on the other hand, you talking about the ‘portability’ of badges then, absolutely, that’s exactly what we’re aiming for. Multiple badge backpacks, a completely open and decentralised system, and learner sovereignty. The learner earns badges from issuers and then chooses where to host and display them. Why is Mozilla interested in creating a system for credentialing learning? We’re a non-profit that believes in the Web. We believe that it’s a fantastic platform for innovation – but only if it’s open, democratic and built upon standards. Because learning today happens anywhere, including on the Web, we want a credentialing system that can bypass the ‘gatekeepers’ to learning. We want better ways to credential experiences, knowledge, interest and skills. Are all Open Badges public? They can be. By default when they’re issued, Open Badges are private and can only be seen by an earner who has accepted the badge and placed it in their badge backpack. Once added to a collection (named by the learner) they can optionally be made public and displayed across the Web. What’s the difference between a ‘digital’ badge and an ‘Open’ badge? It’s very simple, but with fairly profound consequences. An Open Badge is a digital image that has metadata ‘baked’ into it. So in the same way that you bake ingredients together to make a cake, so you bake a badge. And again, just as you can’t then remove an ingredient from the baked cake so you can’t change an Open Badge once it’s been ‘baked’. Does Mozilla ‘police’ Open Badges? We’re looking after the ‘plumbing’ of the Open Badges Infrastructure (OBI). Our focus is upon the technical standards underpinning the whole ecosystem, not the pedagogical or social validity of badges. Some Open Badges will be frivolous and playful. Others will be rigorous and pedagogically sound. All of them will be technically valid badges. The value of a badge comes through a mixture of the reputation of the issuer and the rigour of the criteria for obtaining the badge. What happens if I invest time in Open Badges and then Mozilla pull the plug? We’re a non-profit who work (radically) in the open alongside the community. The OBI is a Mozilla product, but it’s more of a model where we’re the lead developers and advocates than having something than can be ‘pulled’. We’re committed to OBI for the long-haul, but even if we were all on several planes that crashed the Open Source community could still develop the infrastructure. How can Mozilla maintain the quality of Open Badges? ‘Quality’ is an interesting word. Another variation of this question is How can Mozilla guarantee equivalency between badges? The short answer is, of course, that we can’t. That’s because we’re the ones developing the technical standard, but not those that are developing all of the badges within the ecosystem. The OBI is a platform for innovation. We’ve already seen many high-quality badges that have been produced by lots of different organisations. But, of course, there will be poor badges. The value of the badge doesn’t come through how difficult it is to issue them, but upon the rigour of what you have to do to get them, and the evidence they point to. That’s within the metadata in the badge itself. One of the newer metadata fields that’s available within the OBI is a field that allows you to enter the URL of which standard you’re aligning to. So whether it’s a badge that aligns with the Common Core or the Web Literacy standard, there’s something you can point to as a common reference point. The ‘endorsement’ functionality that we’re working upon could then allow organisations to endorse certain badges as being good/valid representations of that standard. What’s the quickest way of getting started issuing Open Badges? There’s broadly three ways to start issuing badges. The first is to use a third-party badge issuing platform such as badg.us, forallbadges or openbadges.me. This is the easiest, but the URLs in the metadata of the badge point towards that third-party platform over which you have no control. The second way to issue badges is to use a plugin for a popular Content Management System or learning platform such as WordPress, Drupal or Moodle. Doing this means that you don’t have to do any coding but the URLs in the Open Badges point back to your domain. The third way is the most complex and involves being (or hiring) a developer and using Mozilla’s onboarding documentation to build your own badge issuing platform or plugin. Apparently it’s not that hard, but I haven’t tried it. What happens when there’s millions of Open Badges in the ecosystem and everyone has thousands of them? Well, first of all that will be awesome! The great thing about Open Badges is that the learner is always in control. That means you can choose which badges to display for what purpose. So, if you want to show all of your gamer and photography badges on Facebook and your professional badges on your online portfolio, you can. The other thing to remember is that an Open Badge does not stand alone, but is part of a wider ecosystem of value. One of the best ways of imagining this is through badge-based learning pathways. In the same way that you collect cheeses/pies in Trivial Pursuit, so badges can work together to unlock a larger, meta-level badge. Once you’ve unlocked your competency-level badge, it would point back to the five skill-level badges of which it’s comprised. How can we trust an Open Badge? How do I know someone hasn’t just bought one? Both very good questions. A combination of the Criteria URL and the Evidence URL should help with this, I think. The (compulsory) Criteria URL states what the earner had to do in order to be issued the badge, and the (optional, but to my mind very important) Evidence URL points to work done in order to get the badge. This is anything that can be displayed on the Web – images, text, videos, etc. Do people buy qualifications now? Of course they do. Will people attempt to (and sometimes be successful in purchasing) Open Badges? Almost definitely. But the difference between traditional qualifications and credentials, and Open Badges is that the latter leave a breadcrumb trail of evidence. My Great Uncle built his entire adult life on a the claim that he attended Oxford University. After his death we found this to be false. That wouldn’t really have been possible in a badge-based system. He would have been found out very quickly! Why are Open Badges any more than stickers? Aren’t they just extrinsic motivators? How can issuers ensure their badges are taken as seriously as possible by institutions/employers? An Open Badge is a metadata-infused credential. Whether badges are taken seriously depends on how trustworthy, relevant and useful they are to others. That’s a function of the reputation of the badge issuer but also on the rigour of the Criteria URL. What did the individual have to do to get the badge? Was that worth doing? Is there an Evidence URL pointing to what that individual actually did? It’s a fact of life that people like (and trust) good-looking things so it’s worth spending some time on the visual design of the badge. But that’s the tip of the iceberg: it’s the learning design, the partnerships and the thinking through how individuals can ‘level up’ that’s important. DigitalMe have a great CC-licensed badge canvas resource to help you think through some of these things. 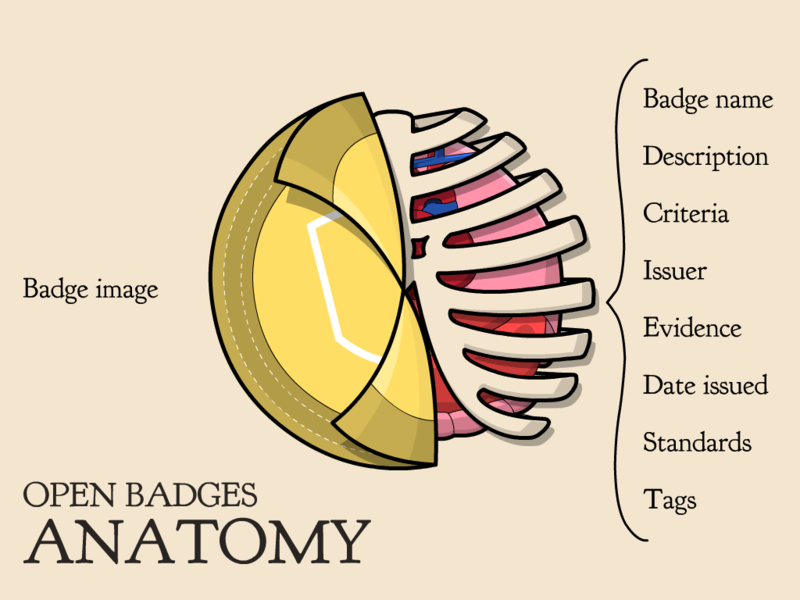 Finally, it’s worth having a useful way to display badges to institutions and employers. Purdue University, for example, have an iPad app that students can use to show their badges at interview. Badges can also be displayed on pretty much any kind of website, including e-portfolios and wikis. Why would I want an Open Badge instead of a degree? I need examples of how to implement this in my class. Hi Brandt, as in a technical howto? More of a “this is your grade, but it’s not really, but in the end I’ll have to convert to an A or a B”. How do I put badges in my grade book? Hmmm… so if I was using badges in the classroom I’d be thinking about the behaviours, skills and attitudes I was trying to promote and work backwards from there. Apologies if I’ve missed something here. the question of why a third-party, such as an employer, can trust in the OBI. I’m not quite reassured by your above use of “should help” & “I think” in connection with the point of trust particularly as you highlight that in your opinion you see the optional Evidence URL as an important element in increasing credibility. Doesn’t this suggest a two-tiered system whereby those badges with an Evidence URL are more credible than those without and if so, isn’t this division consequently detrimental to the system as a whole? Given that it is opt-in/out, why might issuers/earners wish to withhold that information if you think that it has a large part to play in this important area? Surely participants have to play ball with this. Other than that, helpful posts thanks & look forward to reading your rejection of intrinsic/extrinsic motivation as a binary! Interesting. ‘Trust’ is a word a bit like ‘quality’ in that it’s slippery, context-dependent and subjective. At present we trust people who turn up for interview who say they’ve done this and that without really checking their credentials. Open Badges bring metadata to the party, adding both technical and social verification to the process – even if the Evidence URL isn’t used! Hi Doug, I have a question regarding portability of badges. Let’s say I have multiple persona identities: one is my work email address, another a personal email address and another an email address issued by a college I am studying at. I am issued badges to each of these identities and currently they will be accepted to three different backpacks, one for each identity. Will I be able to consolidate my badges into a single backpack? This is a question I’ve had about badges since before I joined Mozilla and, to be honest, I’m no closer to an answer. As far as I’m aware, the limitation isn’t with the OBI but with the Persona login that we use. I’ll raise it again, as I agree it’s a potential stumbling block / issue. I’m just starting with badges and also need an answer to this. Mozilla Persona does let you add multiple accoutns, but then disappointingly you can’t transfer your badges between them. I also want to issue badges at work but then show them off on my personal backpack. Report back when you find a solution!